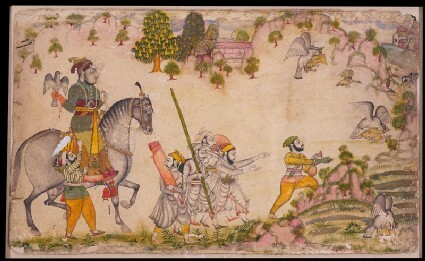 Sangram Singh Ranawat, a Mewar prince or nobleman, rides a well-groomed stallion on his hawking expedition. The attendants carrying his shield and weapons form a statuesque group. The leading attendant and a huntsman gesture forward, as the hawk seizes a fowl in flight and brings it to the ground (as in the previous work Maharana Amar Singh hunting sarus crane [LI118.76]).